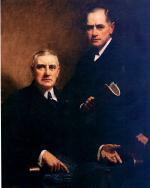 Charles M. Schwab and E.C. Grace, by Frank O. Salisbury. In his singular career, Charles Schwab built three steel companies - Carnegie Steel, U.S. Steel, and Bethlehem Steel - and one golf course, at his rural retreat in Loretto, Pennsylvania. His protégé Eugene Grace built one company - Bethlehem under Schwab - and three golf courses. In the late 1940s Bethlehem Steel already had a championship golf course, the thirty-six-hole Saucon Valley Country Club, complete with all the extras. Grace, as the steel company chairman and a great golf enthusiast, became concerned that unions, which he had fought for years, might just sign up the company's plant supervisors. Grace decided that a new eighteen-hole golf course for the supervisors, the Bethlehem Steel Club, would keep their minds on the company. Soon, the company gave land to the city for building a third, public eighteen-hole golf course where anyone in town might play. Later on, the company built the super-exclusive Weyhill course, where until the early 1990s women were entirely forbidden. President Gerald Ford knew golf courses. While other presidents might have thought about Bethlehem in relation to steel, Ford knew the town for another reason. In 1975 at a White House reception, he spotted the name badge of the town's leading newspaper editor, then strode through the crowd with an outstretched hand and smiling face to say: "Bethlehem! What a golf course." Eugene Grace was a lucky man in that his early career at Bethlehem coincided with the heady days of Schwab's leadership. Schwab had risen through the ranks at Carnegie Steel, and became at age thirty-nine the first president of U.S. Steel in 1901. Soon after he bought Bethlehem and, after his ouster from U.S. Steel, transformed it into the country's second-largest steel producer. Grace was a key figure in Schwab's turnaround of the company. Like his mentor, Grace began his steel career on the shop floor, as a crane operator. With Schwab's backing, and his own technical talent (Grace was valedictorian at Lehigh University with a degree in electrical engineering), he tackled a number of special projects. His most important assignment was building an entirely new $4 million mill for the rolling of oversize H-shaped structural beams. The ability to roll beams up to thirty-six inches in height gave the company a commanding position during the 1920s building boom. Stupendous profits from its wartime contracts allowed Bethlehem by the early 1920s to buy up several formal rivals in Pennsylvania - most prominently Cambria and Midvale - as well as steel plants in Sparrows Point, Maryland, and Lackawanna, New York. Presiding over this sizable corporate empire was Eugene Grace. In 1913, at age thirty- seven, Grace became president of Bethlehem Steel. A brilliant engineer, Grace was less successful in adapting the corporation to changing times. For better or worse, Grace never lost his youthful enthusiasms. He remained convinced, even through the dark days of the Great Depression, that the steel economy would bounce back and that his company was on the right track to prosperity. Grace also led Bethlehem during the glory days of World War II, when the company solidified its reputation as the "Arsenal of America." He kept the company building outmoded open-hearth furnaces through the 1950s, even when German and Japanese steelmakers were adopting more efficient technology. And he remained completely opposed to organized labor. A general manager during the union-busting 1910 strike at Bethlehem, Grace was a supporter of the "open shop" campaign against the Ironworkers" Union and during the 1930s led the "Little Steel" opposition to the New Deal, informing Labor Secretary Frances Perkins to her face of his "sacred policy . . . never [to] recognize organized labor." 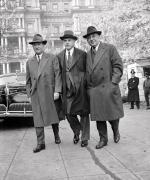 As late as 1941 Bethlehem provoked a major strike when the National Labor Relations Board ruled that the company must abandon its company union. Critics fault Grace for isolating the company from new ideas, wasting the company's sizable revenues on excessive luxuries for corporate executives, and above all not preparing a successor. For some years, even as his health failed, his word as chairman remained law. In Bethlehem at the Moravian Church's venerable Nisky Hill cemetery, you can gauge the rank of many of the company executives by the size of their gravestones. Grace's is a giant open rotunda complete with a granite bench capable of seating twenty mourners. 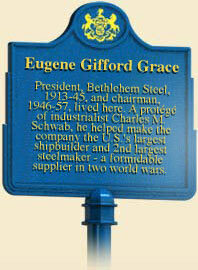 To learn more about Eugene Grace and the work of Bethlehem Steel during World War II click here. Andrew Garn, Bethlehem Steel (New York: Princeton Architecture Press), 1999. Elizabeth C. Sholes and Thomas E. Leary, "Eugene G. Grace," Iron and Steel in the Twentieth Century, edited by Bruce Seely (New York: Bruccoli Clark Layman), 1994. John Strohmeyer, Crisis in Bethlehem: Big Steel's Struggle to Survive (New York: Penguin), 1987.